A former regional daily journalist turned PR boss has published his debut novel inspired by the First World War. Ken Houston, who left The Scotsman 13 years ago to set up his own Edinburgh-based press and PR company, has written The Wee Fellas under the pseudonym of Richard Maitland. The book is inspired by the role played by thousands of volunteer soldiers, under the army regulation height of 5ft 3in, during the Great War. It focuses on a fictional ‘bantam’ battalion reserved for under minimum height soldiers in Glasgow with its hero being a product of the city’s East End slums. Ken, who worked for The Scotsman for 20 years before setting up Ken Houston Media Services, said he has always had an interest in the First World War, particularly the Western Front. “I came across the bantam battalions only by accident because relatively little has been written about them, either in fiction or non-fiction – one reason for penning this novel,” he told HTFP. 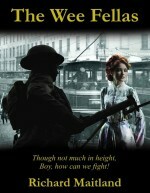 “Another reason for publishing now is that with 4 August 2014 marking the centenary of Great Britain’s declaration of war on Germany, there is likely to be no end of additional work published on the subject in the coming months – so just like the characters in my book (chippy wee men), I ‘wanted to get my retaliation in first’, so to speak. Ken has also won several major awards including BT Scotland ‘Business Journalist of the Year’ in 1998. The Wee Fellas is available in paperback and Kindle by clicking here.